While in Dallas, I knew there were two places I wanted to see. 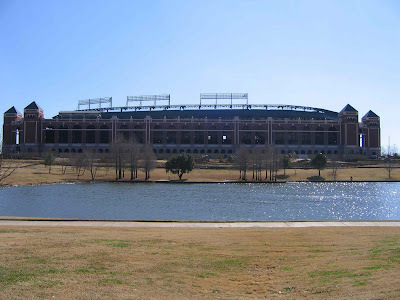 The first was Dealey Plaza and the second was the Ballpark at Arlington, home of the Texas Rangers. I have a thing for stadia [the correct usage of the plural "stadium" for those who are wondering]. I see these places on ESPN all the time, so I like to see them in person if I get the opportunity. 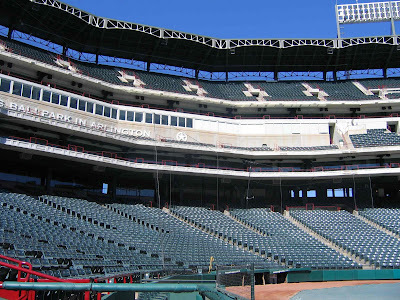 Arlington is located halfway between Dallas and Fort Worth, right next to a Six Flags Amusement Park. I was a little surprised how suburban the location was. Fortunately for me, they had a baseball museum and, for the price of admission, you received a guided tour of the ballpark. Interesting fact: one of the provisions for the people of Arlington [a city itself] financing the stadium was that the name "Arlington" always be attached to it, regardless of the corporate sponsorship. The museum had some great artifacts on loan from the Baseball Hall of Fame in Cooperstown. On one of the walls they had pictures of the "Greatest Teams of All Time" which, according to whomever made the exhibit, the 1976 and 1990 Cincinnati Reds. The second floor was all about Texas Rangers history, of which there is very little [when they have an entire exhibit area devoted to Sammy Sosa, who played just one-and-a-half seasons for the Rangers, you know they're desperate]. It should be noted that the Reds Hall of Fame is much better; it made me appreciate again Cincinnati's rich baseball heritage. The best part was definitely the tour. Another person and I were led around by a wonderful senior citizen named Ed who's been a fan of the Rangers since they relocated to Texas from Washington DC; they were formerly the Senators. Ed led us from pressbox, to luxury boxes to locker rooms. We even had a chance to visit the dugout and walk on the field. I'm not sure if there's such a tour offered at Great American Ballpark, but there definitely should be. 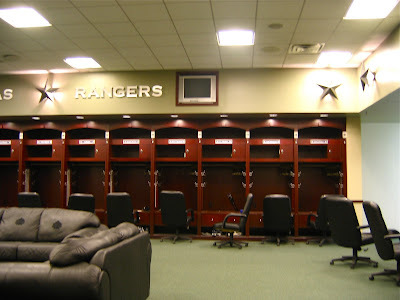 When we were in the locker room, we saw starting pitcher Kameron Loe and newly appointed closer CJ Wilson. I knew Kameron because I picked him up in fantasy baseball last year, so I decided to let him know that. He apologized for a lackluster performance [which I sincerely appreciated] and promised that if I drafted him again, I'd get better stats this year. 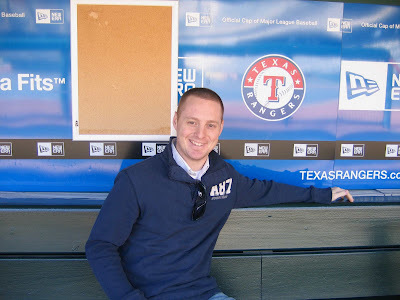 I also let them know how excited I was for them to have former Red Josh Hamilton on their team this year. They replied that they were excited to have him as well. As I left, I was a little disappointed. 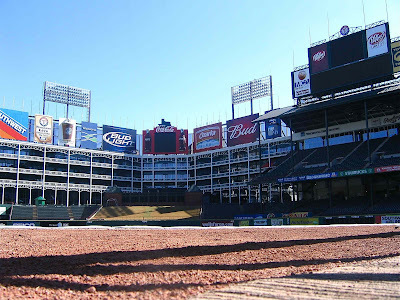 The Ballpark at Arlington is about eight years older than GAB and it's a much better facility. I can't help but be reminded that the county cut corners when it came to the Reds stadium. How about a few pictures. I had the older point-and-click camera, so the quality wasn't quite as good as I liked. Me in the dugout [taken by Ed]. Some locker room, eh? Bad photography, though. 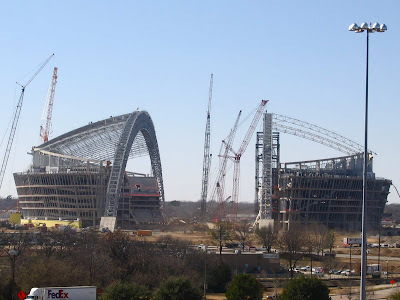 Next door, the new $1billion Dallas Cowboys Stadium being constructed.